While it is doubtful that US President-elect Donald Trump ever read George Orwell’s 1984, Trump’s cabinet choices appear to come right out of the doublethink that ruled Orwell’s dystopian society. In Orwell’s book, the Ministry of Plenty rationed essentials while the Ministry of Truth manufactured falsehoods. Trump’s pick for the Secretary of Energy said last year he wanted to abolish the department. His choice for the Environmental Protection Agency is best known for suing the agency. His proposed Labor Secretary has criticized overtime, minimum wage and sick leave initiatives. His attorney general nominee has a long history of opposing voting rights, women’s rights and once said he decided he didn’t like the white supremacist Ku Klux Klan only after he learned they smoked marijuana. 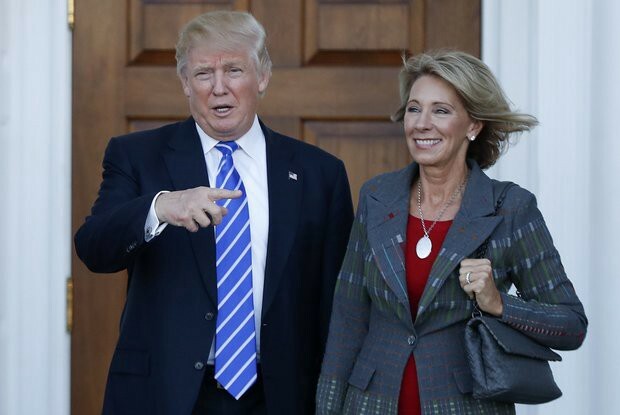 However, Trump’s choice for Secretary of Education, Betsy DeVos, is perhaps the most extreme of Trump’s cabinet nominees. She has spent her entire adult life — and her family’s considerable wealth — mounting campaigns to transfer public dollars away from public schools and into private and religious schools. The 59-year-old DeVos will be in charge of the U.S. Department of Education, which has 5,000 employees and a budget of $73 billion last year. Unlike many countries, the U.S. educational system is decentralized, with much power resting at the state and local level. However, federal policy initiatives have played a growing role in recent decades, particularly in shaping educational policy across the country. Historically, the department has been focused on protecting civil rights in areas of class, race, and gender, and has focused its budget on public schools. Before he won the election, Trump announced his main education focus was to invest $20 billion in federal money to increase school choice. In the United States, the term “school choice” has become code for supporting “independent” charter schools that are nominally public but privately controlled, More threatening, it is code for transferring public tax dollars to private schools, including religious schools, that operate with little to no public oversight. For instance, under U.S. law private schools are able to circumvent basic safeguards such as freedom of expression and gender rights. In general, neither their finances nor their curriculum are made public. Betsy DeVos is the ideal candidate for such an unprecedented policy shift. She has had virtually nothing to do with public schools her entire life. She’s not an educator, nor has she worked for any public school institution. The main organizations she has headed, The Alliance for School Choice and the American Federation for Children, were specifically set up to promote school privatization, and have spent millions of dollars electing local, state and national politicians. DeVos hails from a wealthy family and married into an even wealthier one. Her father, Edgar Prince, was a politically active auto parts businessman. When not making money, he supported the creation of the Family Research Council, a conservative Christian religious group that has been called a “hate” group by the Southern Poverty Law Center for its anti-LGBT views. DeVos’s brother, Erik Prince, is founder of the security firm Blackwater, which ushered in the era of private contractors performing duties for the U.S. military in order to evade public outcry over U.S. operations in the Middle East. Its employees were found guilty of killing dozens of Iraqi civilians in a massacre in 2007. When DeVos married Richard DeVos, Jr., her oligarchic empire expanded. Her father-in-law co-founded Amway, a pyramid marketing company that made millions for its founders. Richard DeVos, Sr., has also been a long-time supporter of right-wing religious and economic groups. Forbes magazine estimated the net worth of the DeVos family as $5.1 billion. This puts DeVos in the top tier of Trump’s oligarchic cabinet — even richer than Trump’s nominee for Secretary of State, who was the CEO of Exxon. Betsy and her husband have continued their families’ right-wing political traditions. They have been powerbrokers in the Republican Party and have donated millions of dollars to right-wing think tanks, foundations, legal teams and political action committees. Known as a smart and determined political organizer, Betsy DeVos understands the important role of labor unions, particularly public sector unions, in opposing privatization. Thus her strategy has long included attacks on unions and worker rights. The Republicans control both the Senate and House of Representatives of the U.S. Congress and it is expected that DeVos and Trump’s other nominees with be approved. But as the last year has made clear, political developments in the United States are highly unpredictable. The fight over the federal role in public education is far from settled. Bob Peterson (bob.e.peterson@gmail.com) taught 5th grade for 30 years in the public schools in Milwaukee, Wisconsin (USA). He is a writer, organizer and presenter and a founding editor of the Rethinking Schools magazine, and former President of the Milwaukee Teachers’ Education Association (NEA). He is co-editor of several books including: Rethinking Columbus, Rethinking Elementary Education, Rethinking Mathematics, Rethinking Globalization and Transforming Teacher Unions. Posted on January 17, 2017 January 18, 2017 by Rethinking Schools	This entry was posted in Current events. Bookmark the permalink. What an important and worrisome issues. Thank you for providing this information and a space for educators and friends of educators to discuss this looming threat to public education in the U.S.